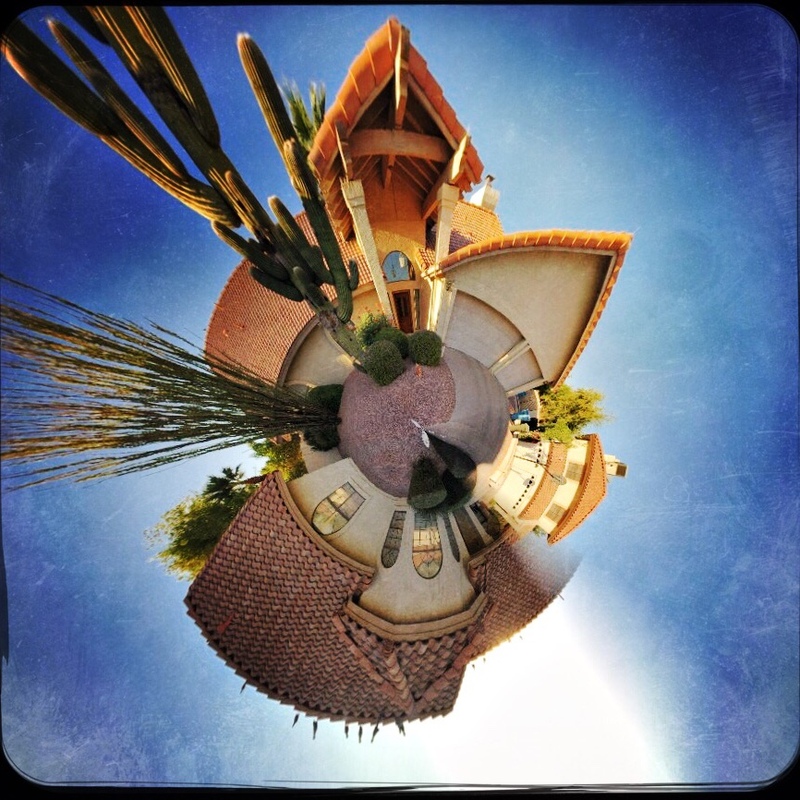 A typical “small planet” effect created in the phone app Rollworld. MANY OF THE APPS BEING PEDDLED as post-production fixes for mobile photographs are one-trick ponies, limited in their range. This is less so than it once was, with new apps adding progressively more features, but there are still tons of single-purpose processes out there, gobbling up phone storage with apps that perform one task well. Want a second task? Download another app. The fun part for me is to discover that, while a given app may have been created to solve a particular problem, it can also be used creatively to do something completely different. Take the example of the now-cliched creation of so-called “small planet” pictures, in which a standard landscape is spiraled into a ball shape, with its various tree and buildings now looking like features on a self-contained world, rather like the illustrations in The Little Prince. This process was once a somewhat complicated one, but, like almost everything else in the digital world, it’s been shorthanded to a few clicks and sliders in apps like Rollworld, which is not only cheap but insanely simple to use. 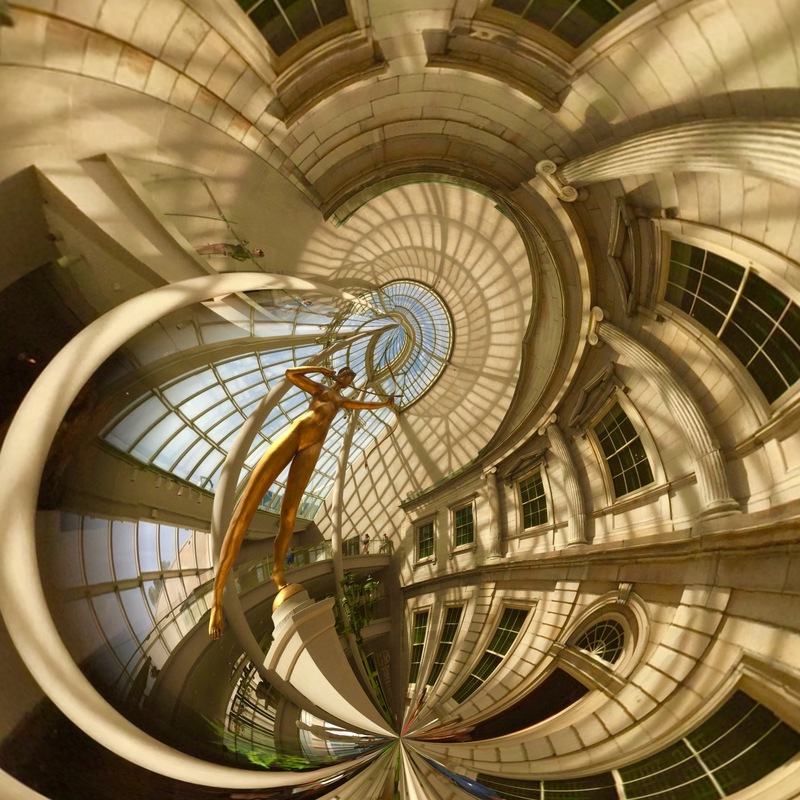 A DSLR image uploaded into a celphone and remixed in the Rollworld app. If you approach the use of such a specialized app in the simplest way, you’ll produce your five or ten little planet images (see photo at upper left corner), get the novelty boiled out of your blood, and then move on to something newer and shinier. However, Rollworld and programs like it can be a nice creative tool beyond their most obvious trick. The various sliders in RW let you not only roll your original linear image but control how it rolls, allowing a kind of folding-in, folding-out distortion. You can thus completely abstract even the most mundane cityscape into a symmetric pattern of textures, maximizing small things or relegating prominent features to the background. Other Rollworld sliders allow you to determine the tightness or looseness of the roll, to control the angle of the pitch, even swipe features from one part of the image across parts of the others to mirror or multiply specific items into a better symmetry. Call it Kaleidoscope-in-a-box. I even import some of my standard DSLR images from various websites like Flickr (see above right) into my phone so they can be processed by the app as well. One problem: You want to save your end product at the highest possible file size. Even at that, some of them will only display well on monitors or the web, and may be too small for good resolution when printed out. This is a major problem with phone images in general: they are still designed, for the most part, to be outputted to other phones and screens. The idea here is that many apps are capable of giving you more than the advertised effect if you play a little. It takes so little time and effort to experiment that you quickly build experimentation into your typical workflow. And that can only help you grow faster as a photographer. This entry was posted on October 29, 2017 by Michael Perkins. It was filed under Abstract, celphone cameras, Digital Photography, editing and was tagged with Interpretation, Phone apps, post-processing.